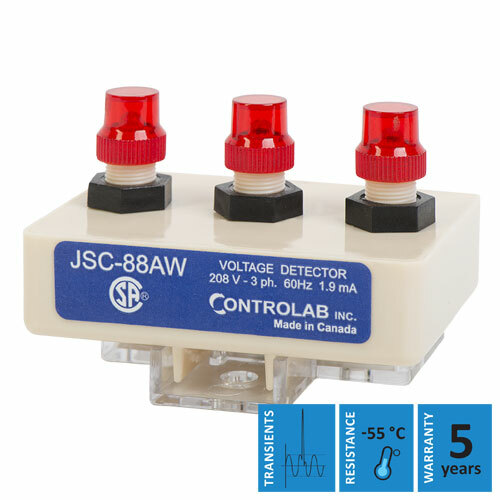 The JSC-88AW is a very reliable way to know for sure whether or not there is voltage downstream from the switches or breakers during power-offs. It dramatically increases the safety of personnel assigned to maintenance work on electrical equipment powered by three-phase voltage. As long as voltage is present downstream of the breakers, one or more (LEDs) of the JSC-88AW will stay lit. A simple visual inspection tells you whether the electrical system is in “Zero Energy” mode. In addition, this new device has been improved to enable resistance to voltage spikes (transients). The JSC-88AW’s small design allows for direct installation on the door of the switch board, the starter or the control panel. Fully calibrated in our laboratories, the JSC-88AW voltage detector is also easy to install and ready for operation. The JSC-88AW voltage sensor is fully calibrated in our laboratories and therefore delivered completely ready for operation. Installation takes about 10 minutes per device and can be carried out by anyone. Watch this video to learn how. The new JSC-88AW may be used at temperatures as low as -55 °Celsius. This new device has also been improved for higher resistance to harmful voltage spikes in industrial environments. These transients, which are increasingly frequent nowadays, can seriously harm electronic devices. Designed specifically for outdoor applications, the JSC-W is equipped with components that can withstand up to -55 °C. 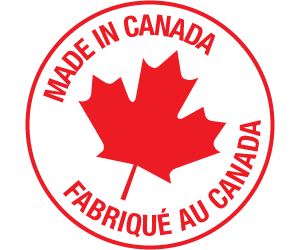 Our equipment has been tested in a climate chamber in a specialized laboratory to meet the needs of customers living in Northern regions. This detector’s warranty was increased to 5 years. 1- Does the JSC-88AW require a ground or neutral connection to function? 2- Is it still possible to connect a JSC-88AW to a fully floating electrical system (Delta) without a ground? YES, if you use our KD-Kit wiring kit, it will create an artificial neutral from the 3 phases that supply the voltage detector. However, the presence of 2 or more phases is required so that this neutral can function properly and allow the JSC-88AW LED lights to turn on. If there is only one phase, there is no return path, therefore, none of the 3 LED lights will turn on. 3- Will the 3 LED lights on the JSC-88AW turn on if the KA-Kit wiring kit is connected to resistors placed on the JSC-88AW end instead of the switch end? 4- Can the JSC-88AW be used to detect a phase loss? This is because there is also potential for reverse flow from the control transformer, the motor winding or even the electronic devices connected to said switch. All these possibilities will allow the JSC-88AW to detect voltage that could be dangerous for the electrician or maintenance engineer. 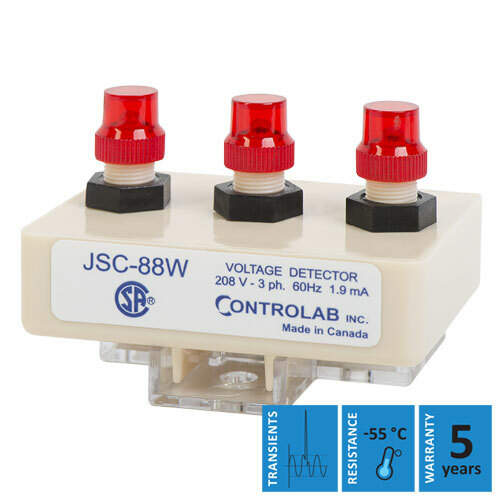 The JSC-88AW is a device that was designed to save lives in an industrial environment by visually indicating the presence of a three-phase voltage. 5- Can I install a JSC-88AW on any electrical system? NO, because the JSC-88AW requires a ground or neutral connection to light up. 6- When installing the KA-Kit voltage reducer kits with a JSC-88AW, can the wires be installed in any direction? NO, because the KA wiring kit has to be installed in the right direction for the JSC-88AW LED lights to turn on correctly. And, secondly, for security reasons mentioned in number 8.